Time to wave goodbye to the ‘Winter Bod’, the less glamorous and unappreciated incarnation of the ‘Dad Bod’ made famous by the likes of Leo DiCaprio. Let’s face it, Winter Bod ain’t getting you no super models on a yacht. If your goal is to get shredded, the focus should be not on weight loss but rather on fat loss with muscle maintenance. You didn’t spend winter eating like an animal and working out like a beast just to lose all your size come spring. 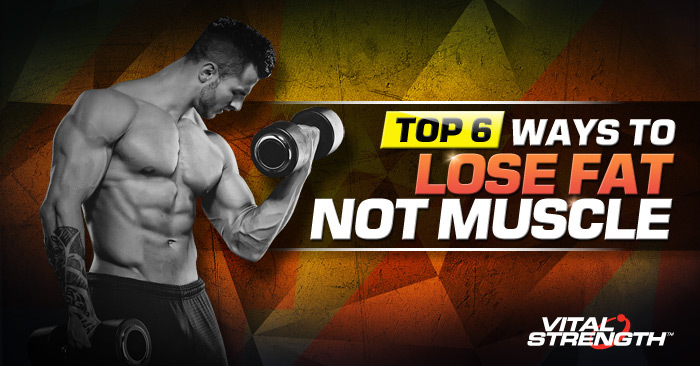 Follow these tips to lose fat without losing your hard-earned muscle, for a ripped muscular physique guaranteed to win you more double-taps on Instagram. Always include heavy strength training in your program when cutting calories in order to maintain lean muscle mass. Switching to light weights in an effort to ‘cut’ or ‘define’ muscles is unlikely to work – you’ll lose muscle mass and strength. You lifted heavy to build that muscle, and you need to keep lifting heavy to preserve that muscle. Strength training tells your body that it still requires all your muscle mass. Remove the stimulus and you remove the body’s reason to maintain that muscle. Keep up your current routine as much as possible. If it’s too much for your body to tolerate and recover from while under an energy (i.e. calorie) deficit, you may reduce your volume or frequency but strive to maintain your current strength levels. By doing resistance training to maintain muscle mass, your RMR (Resting Metabolic Rate) also won’t drop as much as you lose weight. Maintaining that higher metabolic rate means more energy burned in and out of the gym! Protein intake plays a major role in preventing muscle loss during a shredding phase. You’ve heard it before but protein is an essential macronutrient for building and maintaining lean muscle tissue. As calories are cut, the body struggles to keep sufficient energy stores and will therefore break down muscle proteins to satisfy energy needs. You’re going to need optimal levels throughout your cut in order to fight this catabolism and maintain your muscle mass as much as possible. The International Society of Sport Nutrition recommend that exercising individuals ingest protein ranging from 1.4 to 2.0 g/kg/day. If you’re engaging in strength/power exercise, you should be shooting for the upper end of this range. Whey protein powder, chicken, turkey, lean beef, eggs and milk should be main staples. Fight the hanger! Getting a decent protein hit will also help with satiety levels, reduce hunger and help you manage blood sugar insulin, thereby decreasing sugar cravings. Don’t get overexcited come shred time. Trying to lose fat too quickly will inevitably result in muscle loss. Gradual weight loss in the range of 1kg per week for athletes is reasonable and attainable while maintaining strength. A 2012 study showed that by reducing energy intake by 500 compared to 1000 calories per day, athletes were able to completely avoid muscle loss while still improving their 1RM squat performance by 12%. Sure, it took them 3 weeks longer to lose the same amount of weight as the 1000-calorie-reduction group but they were able to maintain their muscle mass and their athletic performance improved significantly. In the same vein, don’t try to cut your calories too drastically unless you want to do your muscle mass and your metabolism some damage. In order to lose body fat, you must consistently take in fewer calories than you burn. It’s not rocket science, bro. But trying to speed up the process by cutting too hard could be a bad idea. For most, aggressive calorie restriction will result in low energy levels and reduced training performance, which equates to muscle loss. Low calorie diets can increase stress levels and elevate cortisol, leading to increased fat storage – especially around the middle where your abs should be. Instead, aim for a high protein diet low in refined carbs, which will help you maintain lean muscle and metabolic rate. “Cardio kills gains” isn’t just an excuse for your mate with “bad knees” who puffs and pants on a 10-minute jog. There is some truth behind the cardio-hating motto. You want to burn calories but excessive endurance cardio can lead to the loss of lean mass, especially if done in the absence of (or at the expense of) heavy strength training. This results in a degraded metabolic rate, so you’ll have to eat less and train more to compensate otherwise you’ll gain fat. High intensity interval training should be your go-to cardio for getting lean and building muscle tissue. Adding one or two HIIT sessions per week can help maximise fat loss and boost your body’s natural fat-burning metabolism. Ideally, if you’re creating a proper calorie deficit through your diet and maintaining intensity of your weight lifting program then there shouldn’t be a need to perform huge amounts of cardio to get the results you’re aiming for. If your training and diet are on point, you can enhance your results with properly chosen supplementation. Not eating right and lifting heavy? Then don’t expect supplements to do the work for you. Studies show glutamine supplementation helps to minimise breakdown of muscle and improve protein synthesis. Glutamine is the most abundant amino acid in muscle, contained in over 61% of your skeletal muscle, but is significantly depleted after a strenuous workout, which can decrease strength, stamina and recovery. With its ability to improve GH levels, plus its anti-catabolic benefits, glutamine is an excellent choice for preserving muscle while dieting. 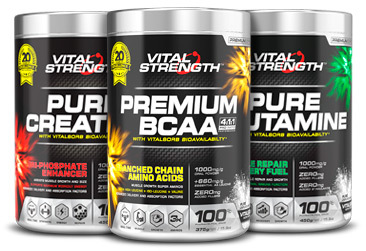 Branched Chain Amino Acids (BCAAs) consist of leucine, isoleucine and valine, which make up about 35% of your muscle mass. They help to activate protein synthesis and also diminish muscle protein breakdown. Protein is a must-have for any bodybuilder wanting to preserve muscle, and a protein powder is a quick, convenient, calorie-controlled method to ensure you’re hitting your targets. A whey protein like Vitalstrength 100% WHEY low carb protein has an excellent amino acid profile containing all essential amino acids. It’s important to get all these EEAs in your diet, especially when you’re on a calorie-restricted plan, so that your body does not have to break down muscle to get them. Creatine is excellent for taking your workouts to a higher level, especially when you may be otherwise lacking in energy levels. Creatine helps replenish ATP in the muscles, allowing you to lift weights for a longer period and maintain your strength while you shred. If you’re shredding hard, there will inevitably be some muscle loss but by following these steps you can minimise catabolism as much as possible. It’s all about heavy lifting and smart nutrition to build your ideal physique for the summer ahead. Bring on the yachts and super models! Franchini E et al, Weight Loss in Combat Sports: Physiological and Performance Effects. Journal of the International Society of Sports Nutrition. 2012. 9(52).